This undated file photo provided by the Ohio Department of Rehabilitation and Correction shows death row inmate Robert Van Hook, convicted of the fatal 1985 strangling and stabbing of David Self, a man he met in a bar in Cincinnati. Attorneys for a condemned killer are asking that their client be spared, saying he experienced a "homosexual panic" of self-revulsion before killing the man he picked up at the Ohio bar. The Ohio Parole Board is scheduled to hear arguments on Thursday, May 24, 2018, for and against Van Hook's clemency request. 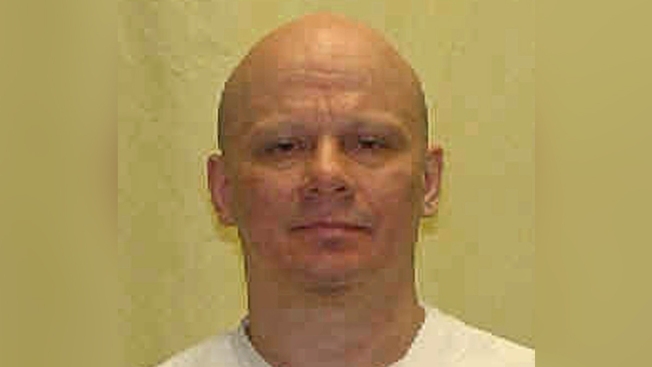 A condemned killer is asking the Ohio Parole Board for mercy, saying he experienced a "homosexual panic" of self-revulsion before killing a man he picked up at a bar more than 30 years ago. Death row inmate Robert Van Hook was sentenced to die for fatally strangling and stabbing David Self in Cincinnati in 1985. Van Hook fled to Florida afterward, where he was arrested and confessed. At the time of the killing, Van Hook was suffering from long-term effects of untreated mental, physical and sexual abuse as a child and was depressed that his life seemed to be falling apart, his attorneys argue. He also was "troubled by increasing questions about his own sexual identity," his federal public defenders said in a May 17 filing with the parole board. They also said he was improperly questioned by a Cincinnati police detective after he was arrested in Florida, and should have been provided an attorney. The parole board planned to hear arguments on Thursday for and against Van Hook's clemency request. Republican Gov. John Kasich has the final say. Van Hook's execution is set for July 18. Prosecutors dismiss Van Hook's "panic" claim as nonsense, saying he made a practice of luring gay men to apartments to rob them. "This is a man who had cynically manipulated homosexuals for years. He posed as a gay; he frequented bars that were gay and he preyed on vulnerable victims who were gay," the Hamilton County prosecutor's office said in a Tuesday filing with the board. Prosecutors also note Van Hook has an extensive history of violence while incarcerated, including stabbing a fellow death row inmate in November. The so-called "gay" or "homosexual panic" defense has come under fire in recent years. Five years ago, the American Bar Association urged governments to pass laws limiting the defense, saying a victim's sexual orientation or gender identity should not be blamed for a criminal defendant's violent reaction. Earlier this year, Illinois became the second state after California to prohibit the defense. The Rhode Island House of Representatives voted on Wednesday to ban it. Authorities say Van Hook, 56, met Self at the Subway Bar in downtown Cincinnati on Feb. 18, 1985. After a couple of hours they went to Self's apartment where Van Hook strangled the 25-year-old Self to unconsciousness, stabbed him multiple times in the neck and then cut his abdomen open and stabbed his internal organs, according to court records. Van Hook stole a leather jacket and necklaces before fleeing, records say. The U.S. Supreme Court upheld Van Hook's death sentence in 2009.